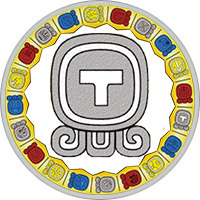 Mayan Name: IQ / Ik. Meaning: Wind, Air, Spirit, Soul. Compatibility: Wind, Death, Dog, Jaguar, Flint. The sign of the Wind (Ik) is the energy of movement, the spirit that infuses life into all life on Earth. The meaning of the sign is air, the patron is the God of the wind, and the symbol is the T-shaped cross. The life of the ancient Maya strongly depended on weather conditions, gave a mystical significance to ordinary natural phenomena. It was believed that the wind is able to penetrate into the human body, cause in it a variety of diseases. Blame all evil spirits — the constant companions of the wind. At the same time, air currents are driven by thunderclouds that carry life-giving moisture. Therefore, the wind is the breath of life, the symbol of the birth of all life. The people of the sign of the Wind have an irrepressible energy, they want to change the world for the better. A distinctive character trait is independence, the ability to think easily and freely. It is impossible to predict their actions and actions, The wind is a symbol of changeability and impermanence. Often impulsiveness leads to sad consequences. The proud and stubborn do not like to admit their mistakes, although they can benefit from any situation if they wish. The people of this day must give account of their actions, strive to develop spiritually. Excess of energy, inability to control it can lead to outbursts of aggression and fury. In work, the people of the sign of the Wind show firmness and determination. Despite the friendly attitude towards colleagues, they do not take their advice at all. Unfortunately, in some cases they behave like irresponsible people, in case of failure they can drastically cool to their favorite business. But natural optimism, vital energy help to avoid happily enough serious problems. The wind is a leader capable of decisive actions. An energetic, sociable person of this sign is able to achieve success in his profession. He is in charge of managerial positions: director, manager. In a romantic relationship, people of this sign are not reliable partners. Unquenchable energy, the desire for freedom, brings them forward, in search of new adventures. Thinly sensitive nature needs bright emotions, experiencing pleasure from communicating with beautiful people. He tries to find in the chosen one not only a loyal partner, but also an interesting person. Beloved ones must accept the peculiarities of his character: The wind is a natural element that can not be tamed. It will find happiness with a loving, faithful person who puts the interests of an impulsive, inconstant partner above his own. A charismatic Wind man attracts the attention of women, not thinking about the consequences of his frivolous behavior. He is too heartless and cruel, believes that he has the right to personal freedom. He does not consider it necessary to hide his egoism, often neglects the desires of a woman. This behavior also demonstrates at work: he is a leader who does not tolerate interference in his affairs. Extremely polite and courteous man is pleasant in communication, but adamant in business matters. At the same time, it’s never boring with him, the man of this sign is a bright personality, attracting attention with extraordinary actions. Possessing an imaginative woman-Wind is often in captivity of her fantasies. Often, her vision of reality differs from what is happening around her. At the same time he considers himself to be a sufficiently sober person capable of resolute actions. In difficult situations, intuition helps her, tries to listen to inner feelings, acts quickly, without preliminary thinking. In his personal life he strives to find a reliable partner, her dream is a strong family union. But does not leave unattended courting fans who are fascinated by their lightness and spontaneity.